Buses in the West Midlands are managed by Centro, which has the brand name of Network West Midlands. Their logo, a stylised ‘n’ can be seen on bus stations, bus stops and travel literature in that area. The main bus operator, for the purpose of this video presentation, is National Express West Midlands (NXWM), but buses from Arriva Midlands, Central Buses, Diamond Bus, Hansons, Igo, Banga Travel, Claribels, Sunny Travel and First are also seen operating. Each operator has its own distinct livery and at the time of filming in June and July 2015, NXWM were re-branding and introducing a new livery across their fleets. In the West Midlands (excluding Coventry) the present white with a red front livery, introduced in 2007 is now changing to a smart deep red and maroon with gold trim scheme, with Platinum branded buses carrying a two tone grey with a red trim livery. The new schemes can be seen on the latest ADL E40D MMC double deckers, with new ADL E20D MMC single deckers in the red livery. Double deck buses in the NXWM fleet are ALX400s, Enviro400s, Volvo B7TLs with Wrightbus Gemini, ALX400 and Plaxton President bodies as well as Scania OmniCity buses. 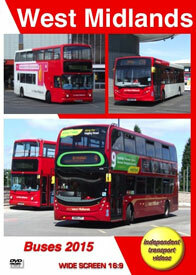 Single decks are Scania Omnilinks, Volvo B7RLEs with Wright Eclipse bodies and Enviro200s. The integral Mercedes-Benz O405N single deckers are also seen in their final days, all will be gone by the time you see this film. There are many interesting vehicles operated by the other fleets, which you will see when you watch this programme! Our filming starts in Stourbridge where we record the comings and goings of both NXWM buses and those of the smart local Hansons fleet in the town’s new bus station. With further film completed in other parts of the town we move to the busy interchange at the Merry Hill Centre in Brierley Hill. From here we move to Dudley to film the action in the bus station and on the streets. The bus station in the busy town of West Bromwich is next on our itinerary. There is also plenty of bus action around the town in adjacent streets which we record. After a brief stop at Wednesbury we head into the city of Birmingham. Here we film at over a dozen locations! Some of these include Colmor Row, Bull Street, Corporation Street, Priory Queensway, Moor Street Queensway, Albert Street and High Street. We also film in the Birmingham suburbs of Perry Barr and Handsworth. At the latter we see buses operating on the famous ‘Outer Circle’ service 11A/C, a route always associated with the erstwhile Birmingham City Transport. Walsall is our next location. A busy town with a very busy bus station. NXWM buses are seen working alongside Arriva Midlands vehicles as well as Central Buses. Wolverhampton is our next stop with action recorded on Pipers Row, Litchfield Street, Queen Square and in Stafford Street and Broad Street. Here we see the final DAF Optare DB250 Spectra double deckers in action, which are soon to be retired from the fleet. Solihull is our penultimate destination with plenty of action here featuring most NXWM types as well as Diamond Bus and Sunny Travel. We conclude our visit to the West Midlands at Bromsgrove. Here at the small bus station we see independents alongside Diamond Bus and First providing the transport. We finish with some archive video by Malcolm King, and hope you enjoy your visit to the West Midlands with us. Our next visit will feature more action from the West Midlands including Coventry!